View out of the cab window of the train taken as it passes the Paget Road railway crossing. 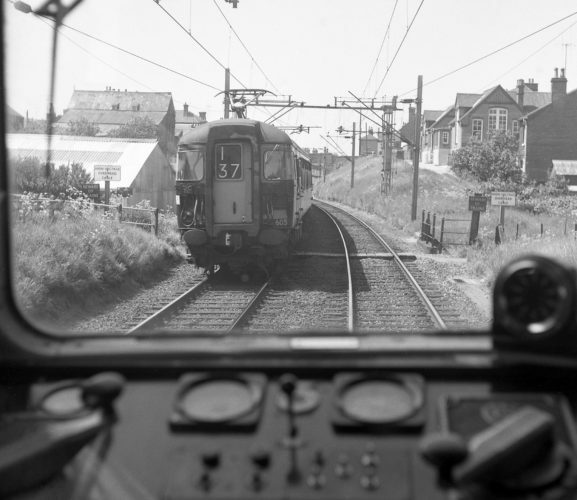 This photograph was taken by an unknown person some time around 1963/64 from the rear cab of the train on its way to Brightlingsea. It clearly shows the foot crossing at Paget Road, Wivenhoe. The infants school in Phillip Road is very clear; within 50 years, the old school is totally obscured by bushes and trees which have been allowed to grow up over the years since this picture was taken. The picture was taken from the rear cab of a DMU, i.e. a Brightlingsea train, which will have been very slowly approaching the red signal at Anglesea Road bridge, and hence the ability to take the pic easily. This page was added on 11/01/2019.